Fielded in the 1950s the M41 Walker Bull Dog tank remains in service in a number of Asian-Pacific armies. Though upgraded in local initiatives they are considered inadequate for today’s battlefields. 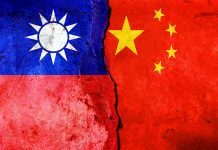 Programs to replace the M41 are being pursued in both Thailand and Taiwan. Thai M41 shown. Mobility, firepower and protection. Three qualities of the Main Battle Tank that are seeing regional armies keep to modernise their stocks. The tank is a uniquely valued battlefield asset due to its unique combination of mobility, firepower, and protection. It is equally capable of executing offensive and defensive operations with the ability to shift from one to the other literally in minutes. The tank can also demoralize an opponent sowing confusion and fear thereby breaking down the cohesion of their combat and support forces. It possesses arguably the greatest capacity to physically destroy an enemy and his assets of any other single ground combat system. Yet it is its ability to apply precise fires while moving at speed and to reposition to attack or defend from unexpected quarters at will that are it’s most significant attribute. In many ways the physiological impact is the tanks greatest contribution. It is the combination of mobility, firepower, and protection that defines the tank. The impact of these attributes is not necessarily dependant on even some ‘perfect’e mix of these characteristics. In fact, history has repeatedly shown that small numbers of tanks even with lesser capabilities have dominated battlefields. The success of Japan’s lightly armoured and armed tanks in overcoming the British Commonwealth defence of the Malaya peninsula in 1942 is a case in point. The fact is that the tanks attributes are multiplied when it is employed and properly supported in terrain and conditions where or when it is not anticipated. It is a tactical lesson armies operating in the Asian-Pacific appear to have taken to heart as they acquire not only modern main battle tanks but develop and field other highly manoeuvrable and deployable direct fire gun systems. The current generation of main battle tank (MBT) has become to some military the ideal combination of mobility, firepower, and protection that cannot be compromised. The difficulty is that this MBT has become increasingly difficult to move easily in response to operational demands. This is particularly true on rural roads and over bridges but also travelling long distances on paved roadways. In addition, their transport by air and sea to conduct expeditionary operations is limited. Modern MBT’s like the Rheinmetall Leopard 2A6 have a combat weight of over 62 tonnes. 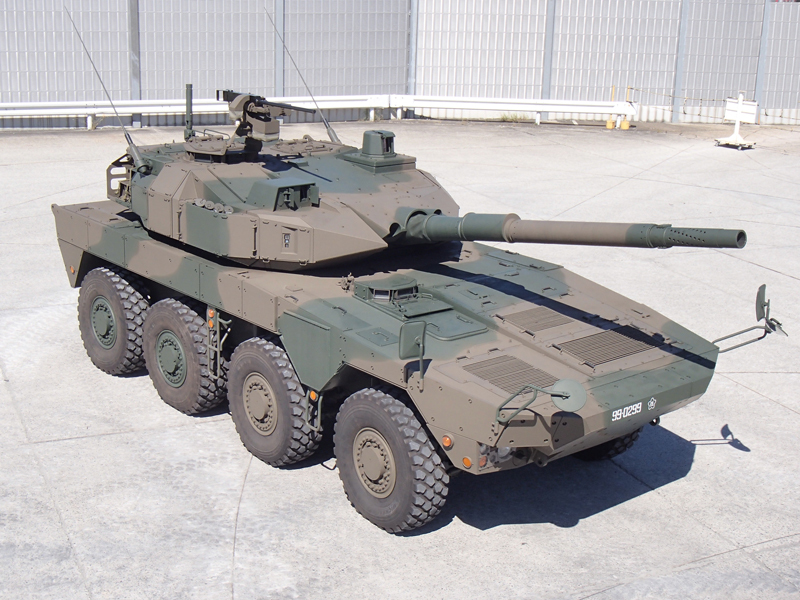 Even the Japanese Ground Self Defence Forces (JGSDF) Type 10 MBT, designed specifically to be lighter, comes in at 48 tonnes. 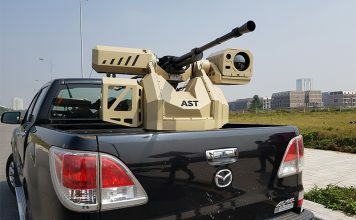 A principle driver for weight is the protection level requested since technologies have been introduced that allow for even 120mm cannon to be mounted in lighter vehicles. A number of armies in the Asian-Pacific have chosen increased manoeuvrability and expeditionary capability accepting reduced passive protection. The JGSDF recognizing a capability gap in its forward defence strategy developed a highly mobile direct fire support combat vehicle. The Manoeuvre Combat Vehicle (MCV) or Type 16 debuted in 2013. Produced by Mitsubishi Heavy Industries the 26 tonne eight wheeled drive vehicle mounts a 105mm rifled cannon. The turret has fire controls equivalent to the latest MBT including the commander’s independent panoramic hunter-killer sight that allows target detection on the move and hand off engagement by the gunner. Its wheeled running gear permits autonomous long distance road movements at speeds up to 100 km/h. In addition, MCV can be transported in the Kawasaki C-2 tactical cargo aircraft allowing deployment to even remote islands. Despite its moderate weight its modular armour resists penetration of 35mm and 40mm projectiles in the frontal area and 14.5mm projectiles all around. The first MCV’s were fielded in 2016 with plans for around 300 and the possibility of replacing some older MBTs. 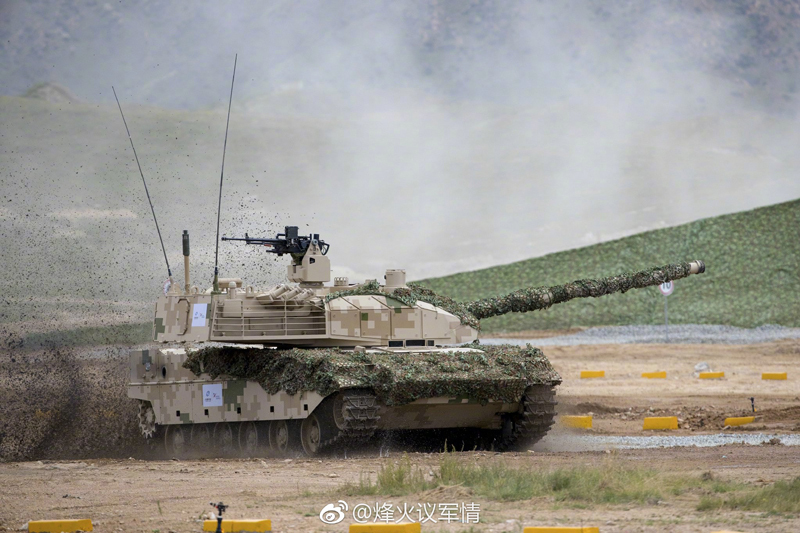 The Republic of China’s (Taiwan)) Clouded Leopard family of indigenously developed 8 X 8 armoured fighting vehicles includes a mobile gun variant with a 105mm rifles cannon. This version has been displayed at several defence shows. It has been considered as an appropriate replacement for the Army’s M41 Walker Bull Dog light tank fleet. Although locally upgraded in the M41D with thermal sights, new fire controls, and a Detroit 8V-71T diesel engine, the M41’s are considered marginally capable at best. Reportedly 400 are still in operational use. Production of the CM-32 infantry version was to begin in 2010 but local news has reported delays which would certainly impact on any further commitment to the ‘gun variant’. Light tanks have the attributes of MBTs but compromise armour protection levels for lower combat weight. This lower weight is more suited for the lower capacity of rural bridges, thus, light tanks found service with many Asian-Pacific armies. Introduced in the 1960s and 70s, armies including the Philippines, Thailand, Taiwan, and Indonesia retain light tanks, albeit upgraded with improved fire controls and, in some cases, larger main armament. 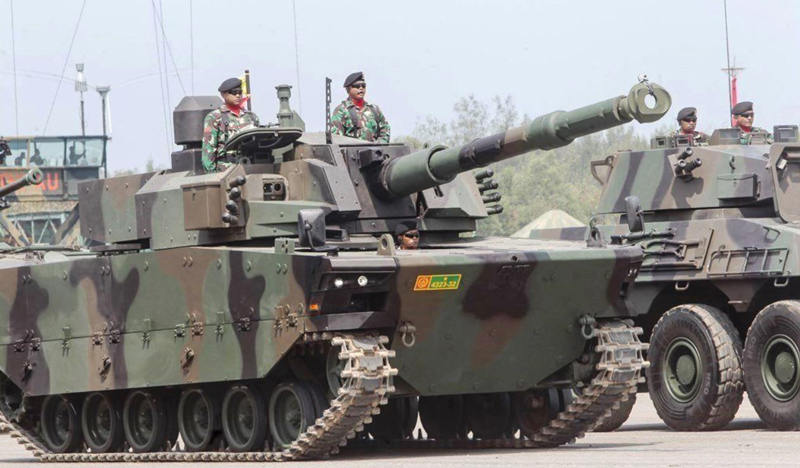 The GIAT (now Nexter) AMX-13, for example, remains in use in Indonesia with a new fire control, and additional armour fitted locally by PT PINDAD. As early as 2011 reports of a new People’s Liberation Army (PLA) of China tank surfaced. This new tank appeared destined for use in the western mountainous regions and was later identified as the ZTQ, a 105mm gun equipped tank with an automatic loader with a 33 tonne weight. Its public display by NORINCO, the developer, at the Beijing Exhibition Centre in 2016 confirmed some of its details as well as the offering of an export version, the VT-5. It reportedly uses composite armour and can fit explosive reactive armour. The PLA is reported to be fielding 300 units. This weight class appears to be a compromise made by other armies as well. Since 2015, Indonesia’s PT PINDAD has been pursuing a joint development of its new Modern Medium Weight Tank (MMWT) with Turkey’s FNSS. Called the Kaplan MT (Turkey) or Harimau Hitam/Black Tiger (Indonesia) it was first displayed in November 2016 at the Indo Defence expo. The 35 tonne vehicle was shown with a CMI Cockerill 3105 turret with 105mm low recoil cannon equipped with an automatic loader. FNSS sources indicate that the MMWT uses modular armour that can provide protection to STANAG 4569 Level 4 (14.5mm armoured piercing and 155mm shrapnel). It also has stabilisation, thermal sights and a commander panoramic hunter-killer sight. Two prototypes currently exist while Indonesian officials have suggested future plans for up to 200 which will be likely replace the AMX-13s. In the United States it is the Mobile Protected Firepower (MPF) programme that has top attention. MPF was earlier defined by Col William Nuckols, director, Mounted Requirements Division to AMR “as a tracked protected direct firepower vehicle that will provide support for the Infantry Brigade Combat Teams (IBCT) in forcible or early-entry operations.” It is to be able to be readily deployed particularly by transport aircraft. The programme has seen effort by the Army to more closely involve industry earlier in the programme development which it hopes will encourage innovation, reduce risk and allow an accelerated schedule. 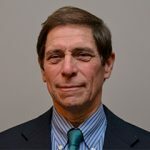 David Dopp, the project lead for MPF stated. “We’ve had constant, positive industry engagement including one-on-one sessions with Industry and top Army leadership.” As a result engaged industry has invested their own Independent Research and Development (IRAD) funds to enhance their potential designs to a level of readiness consistent with the anticipated schedule. An accelerated development and acquisition has been launched by the US Army for a Mobile Protected Firepower (MPF) system which will support the Infantry Brigade Combat Teams. 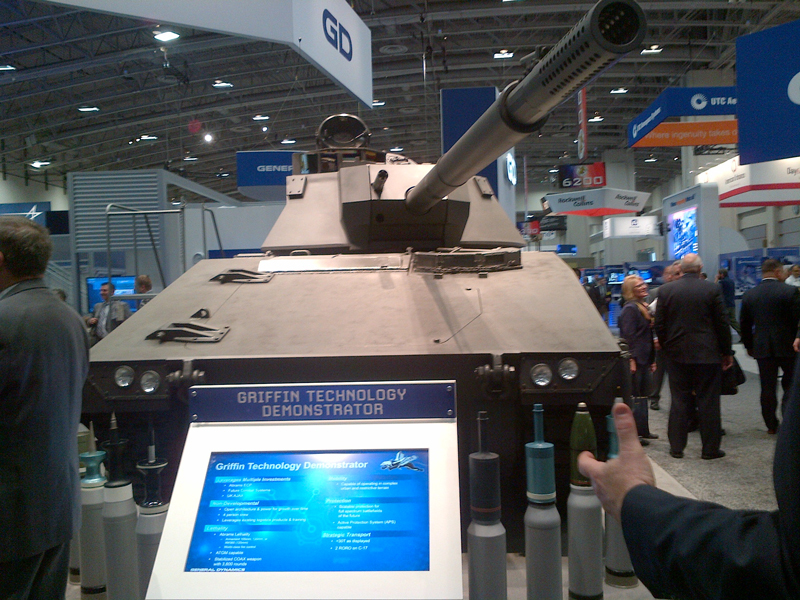 General Dynamic Land Systems has shown its Griffin concept using the Ajax chassis and a light weight 120mm gun. A Request for Proposals (RfP) was released by the Army Contracting Command on 27 November 2017. Two Engineering Manufacturing Development (EMD) contracts will be awarded in late 2018 (1st Quarter Fiscal Year 2019). There are three contenders currently anticipated as General Dynamics Land Systems, BAE Systems, and SAIC. BAE is expected to draw on its M8 Armoured Gun System (AGS) design which Mr. Deepak Bazar BAE Programme Director Combat Vehicles suggested “had been originally developed to meet the Army’s air-drop and LAPES (Low Altitude Parachute Extraction System) requirements. Although an MPF objective requirement we view it as highly desirable and achievable.” General Dynamics has shown a concept using a lightweight 120mm tank gun on the Ajax scout vehicle chassis. SAIC is leading a team that will integrate Singapore’s ST-Kinetics Next Generation Armoured Fighting Vehicle chassis and CMI Cockerill’s 3105 gun/turret system. 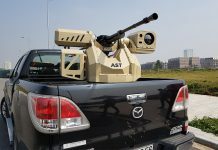 BAE Systems is expected to propose for the MPG an updated version of its M8 Armoured Gun System previously developed for the US Army against a similar requirement for a mobile air deliverable direct fire gun system. The company highlighted at AUSA the capability to air drop the much modernized armoured system. The TNI-AD has ordered 103 of the Leopard 2 RI and taken delivery of more than half of these. Substantial work is being accomplished by Indonesia’s state owned company PT PINDAD and the TNI-AD’s Ordnance Depot. 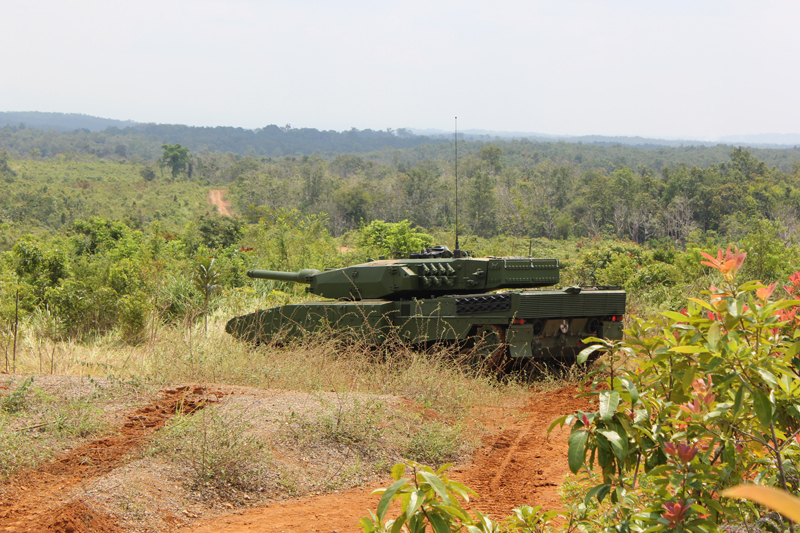 The Singapore MBT contract is being conducted with Singapore Technologies (ST) who’s subsidiary STELOP is providing its Commander’s Open Architecture Panoramic Sight (COAPS). COAPS appears to be being build under licence from Elbit Systems and was first seen on the Leopard SR in May at the Army Open House 2017. Singapore is receiving 66 Leopard SRs. 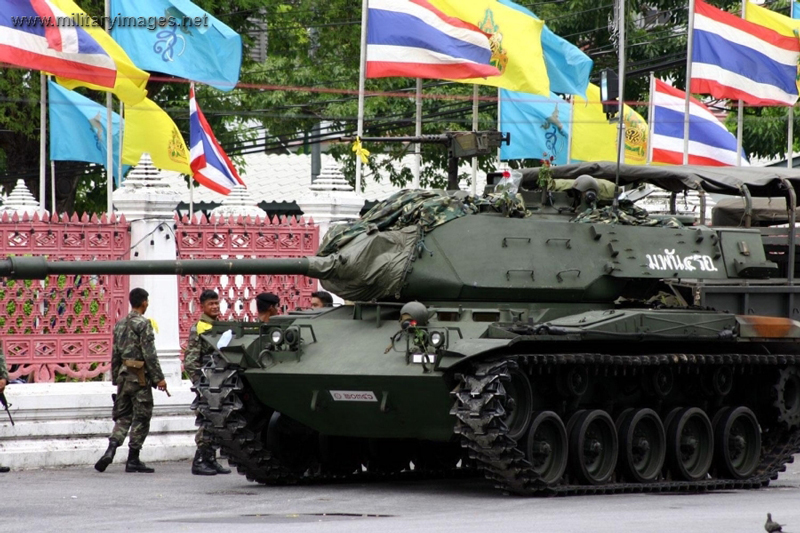 The Royal Thai Army’s (RTA) quest for a new MBT has been taken several twists. Its original intent was to acquire 49 of the Oplot T-84T manufactured by Ukraine’s Malyslev Factory. However, the 2011 contract worth $241 million experienced repeated delays missing the 2014 delivery. 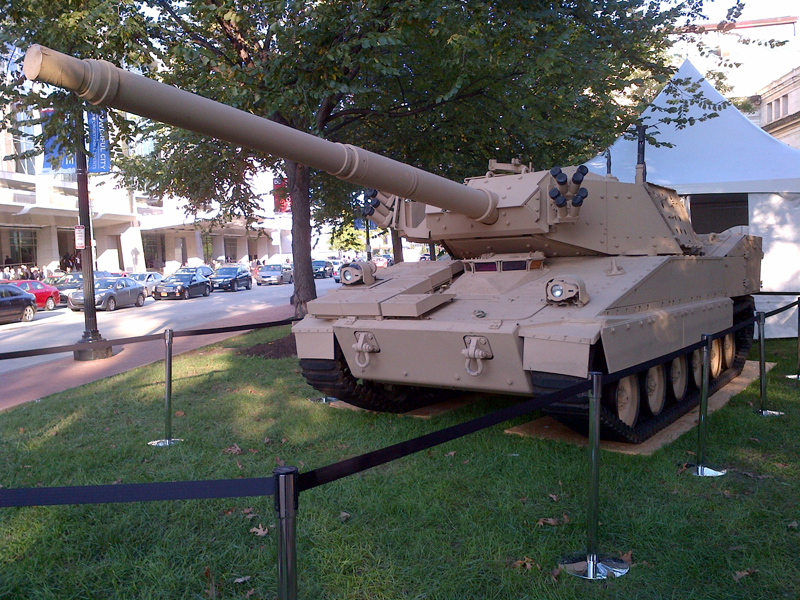 This was a major concern as the RTA had immediate need to begin replacing its 200 1957 vintage M41 light tanks. As of 2017 only 25 T-84s have been received. This prompted the RTA beginning in 2016 to look to other MBT options. With the United States arms embargo in place and China’s government actively seeking improved ties with Thailand, it was not a surprise to see NORINCO step-up with its VT-4 MBT at an attractive price with an aggressive initial delivery schedule. Thai officials have stated the NORICO price to be one third of Western offers. 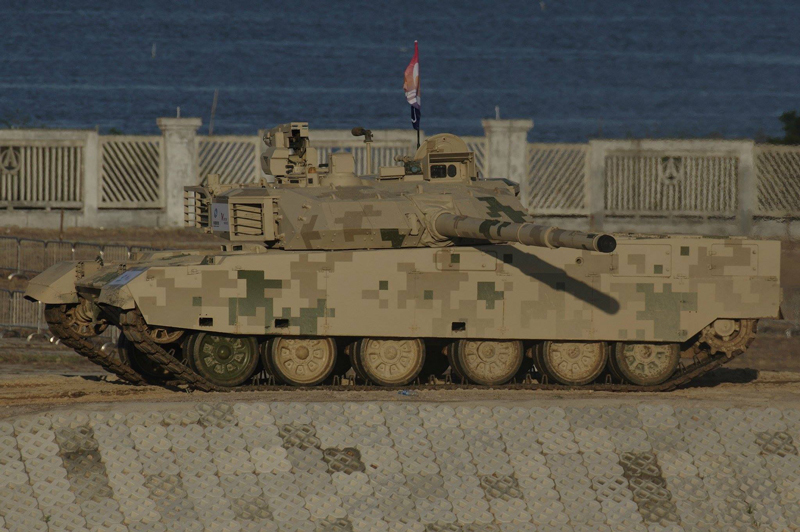 The VT-4 was specifically developed by NORINCO for export and is considered a lesser step-sister to the PLA’s Type 99A. It debuted in 2014 at NORINCO’s Armour Day. The 52 tonne system mounts a 125mm smoothbore tank cannon capable of firing anti-armour, high explosive and cannon launched guided missiles. As typical of T-72 derived designs the VT-4 uses a carousel automatic loader allowing a crew size of only three. The $150 million deal signed in April 2016 saw 28 VT-4s delivered by October 2017. In April 2017 the RTA ordered an additional 10 vehicles at $58 million. This is the first fielding of the VT-4. 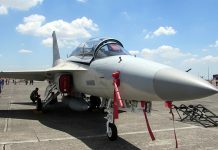 Thai officials have suggested that discussions are underway for possible arms technology transfer from China and establishing production in Thailand, although areas of collaboration or details have not been provided. Vietnam concerned about the age of its main battle tank fleet, in mid 2016 contracted with Russia’s UralVagonZavod (UVZ) to provide 64 T-90S third-generation main battle tanks. The first delivery was reportedly shipped in November 2017. The army is understood to need around 200 MBTs. The T-90S has the 125mm smoothbore cannon and autoloader. 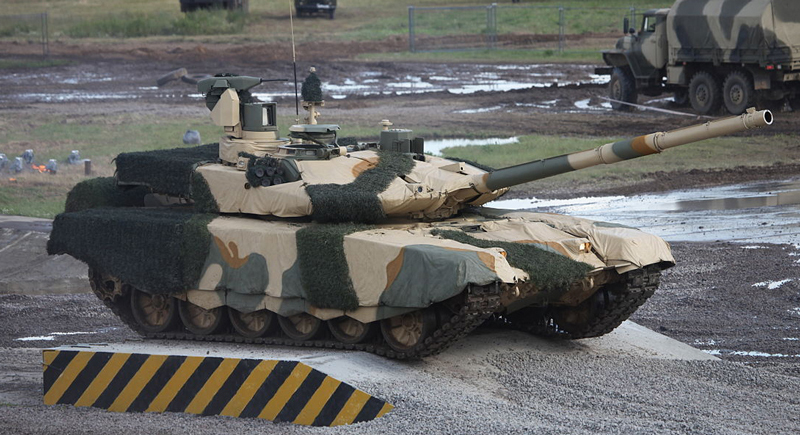 It is similar in capabilities to the T-90s in service with Russia Army and has been widely exported. Vietnam has received its first T-90S MBTs from Russia as the first stage of a program to field up to 200 tanks to replace old T55s. In development since 1995, the Republic of Korea Army’s K-2 Black Panther MBT began to be fielded in 2014. A fully local design it is considered one of the primer MBTs today. Its 120mm L/55 smoothbore gun developed by Hyundai Wia uses an autoloader capable of 10 rounds per minute. The fire control includes a panoramic sight, radar and capability to engage low altitude aircraft. It also fires the Korean Smart Top-Attack Munition (KSTAM) a fire-and-forget munitions with 8km range. The In-arm Suspension Unit (ISU) allows the tank to adjust its height and “kneel. Plans are to deploy 320 of the K-2s while a number of improvements are already being developed including Active Protection and reactive amour. 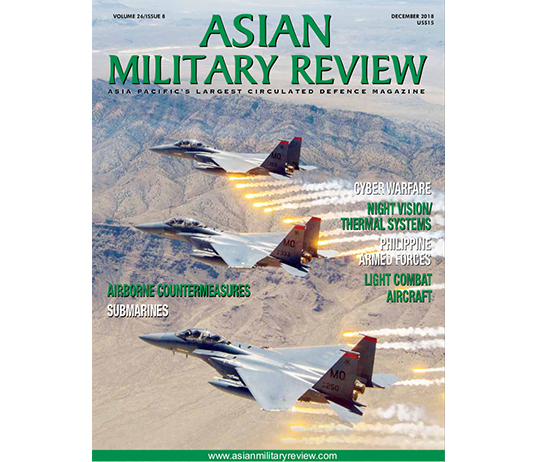 The level of activity in introducing modern tank capabilities into Asian-Pacific armies is unprecedented. The MBT programs will require several years to be completed and to field the numbers of vehicles required. At that point the ‘manoeuvre’ tank will have more clearly demonstrated its abilities. This could find it being considered as a solution for some of these armies to complement these MBTs.